Hello March! Or should I say hello Spring? Not quite yet, but hold on! There are sneakers and hoodies and fresh Spring air in the near future. I still can't believe I'll be flying to Nepal on the 20th! A tiny travel fever is starting to hit me. When I'm back in Estonia, it will be April already! Then I can enjoy the beautiful Estonian Spring at our forest cabin. While in Nepal, I'm planning to embrace all the vegan food experiences and hopefully get some inspiration, too. But before that, I still have a couple of new delicious recipes for you. Like these crispy sesame and garlic potatoes. I absolutely love good old pan-fried potatoes, but this version is definitely a level up. 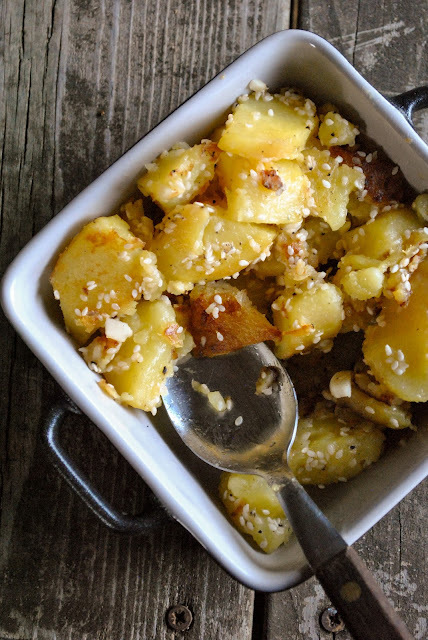 Toasted sesame seeds give a fantastic crunchy texture and garlic always adds so much flavor. And that smell...definitely a must try recipe! This affordable, tasty and easy recipe is perfect to serve as a side-dish or even as a main. Some fresh herbs would be nice too. Have fun! Wash and boil the potatoes (don't peel them) until soft. Drain and let them cool for a while. Peel and slice the potatoes. Heat up a bigger pan, add oil, sliced potatoes, salt and pepper. Cook for a couple of minutes, until the potatoes are crispier. Add sesame seeds and thinly chopped garlic. Stir and cook for a minute or two. Serve.